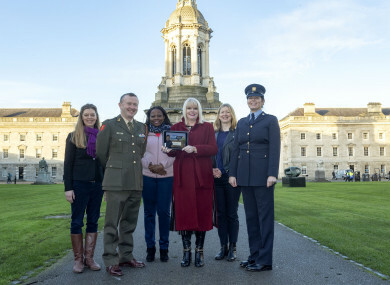 A NEW DIGITAL 2-D role-playing game which will be used for training military, police and civilian peacekeepers in conflict zones has been launched this week at Trinity College Dublin. Gaming for Peace (GAP) is a new training tool with an in-built curriculum in soft skills for peacekeepers, as well as an assessment of those skills. GAP is a European Commission Horizon 2020-funded project, being led and designed by Trinity College Dublin associate professor Anne Holohan. It brings together 15 European partners, including police and military forces such as the Irish Defence Forces, the PSNI, the Finnish, Bulgarian and Polish militaries, as well as the Polish and Portuguese police forces. It is planned that all military, police and civilian personnel deployed in EU conflict prevention and peacebuilding missions, such as Iraq, Libya, Afghanistan and Palestine will be able to receive training through the online game. Soft skills relevant for peacekeeping were identified through the examination of existing training practices, and through in-depth interviews with 180 experienced military, police and civilian personnel. These also served to create authentic scenarios, issues and events related to the soft skills embedded in the game. During the game, players role-play as a member of another organisation, a different gender, ethnicity or nationality. The player is assessed before, during and after the game. They can see through the progress they are making, their improvement in communication, gender awareness and cultural awareness from playing the game. The game is playable in segments to allow for group discussion of the issues it addresses. On completion of training, players can receive an individual ‘Soft Skills Passport’ which is benchmarked to international standards. “Current training for personnel involved in conflict prevention and peacebuilding missions does not prioritise the critical softer skills of communication, gender and cultural awareness,” Holohan said. “Most missions require a variety of organisations to coordinate and cooperate together, including militaries and police from different countries in Europe, and missions are mixed in terms of gender and culture,” she said. Email “This new online game will train military, police and peacekeepers in soft skills ”. Feedback on “This new online game will train military, police and peacekeepers in soft skills ”.